In addition to the unusual design, Glide Bikes also provides some pretty decent features at a very affordable price-point. These include pneumatic (air) tires, a quick-release seatpost, and a lightweight aluminum frame. 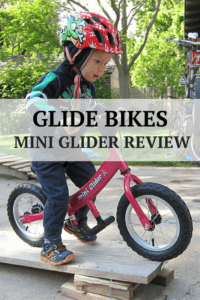 While the Mini Glider certainly isn’t the highest-end balance bike on the market, if you are on a budget, it is well worth your consideration. 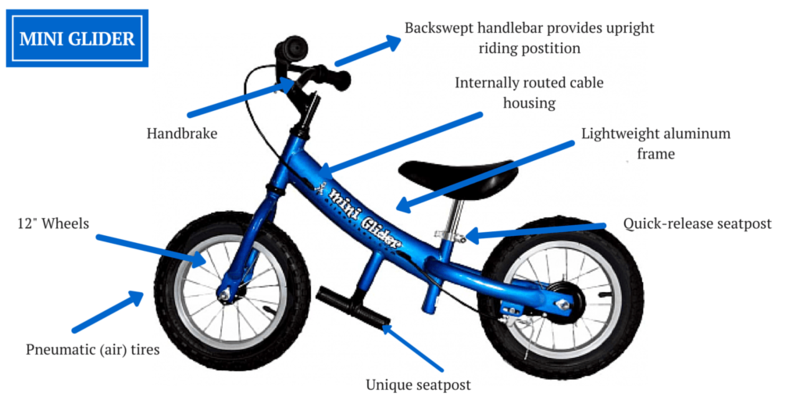 Easy assembly means your child can be riding in no time. 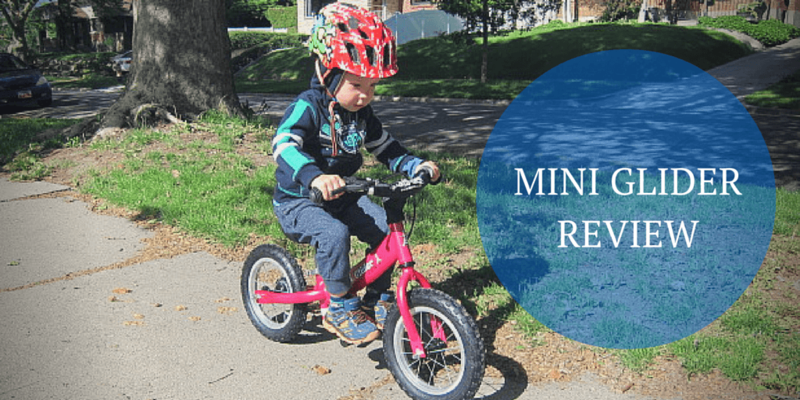 As a kids bike reviewer, I put together A LOT of bikes and I found the Mini Glider refreshingly easy to assemble. 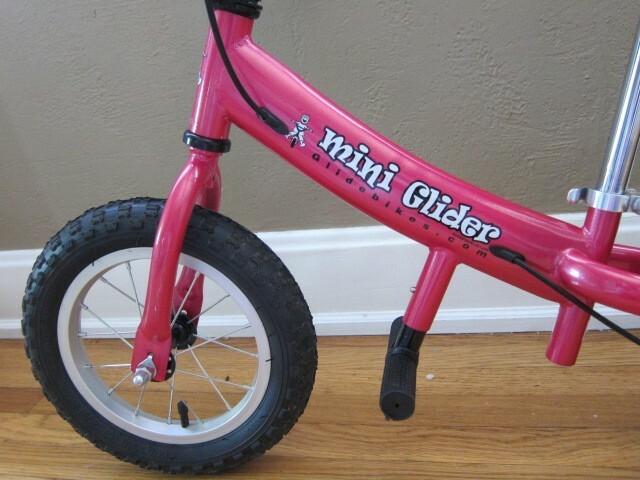 If you are giving this balance bike as a gift, the recipient’s parent won’t end up hating you. Unlike some bikes I’ve assembled lately, all the tools you need are included in the box and it takes 10 minutes or less to assemble and be ready to ride. Many balance bikes for the 2-4 year old crowd weigh upward of 10 lbs. The Mini Glider weighs only 8 lbs, thanks to its aluminum frame. Considering how tiny kids this age are, a few pounds can make it a huge difference in how well they are able to manage the bike, how quickly they get tired, and how much fun they have. The pneumatic (air) tires on the Mini Glider provide good traction and value for little riders. 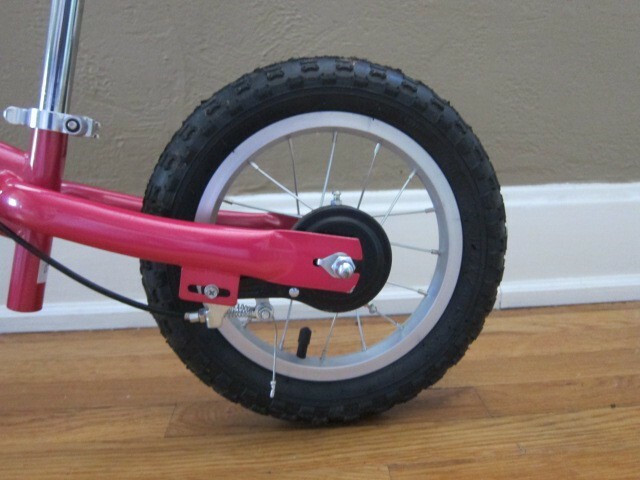 At this price-point, nearly all balance bikes are going to come with foam tires. I was shocked to find that the Mini Glider we received not only came with pneumatic (air) tires, but that they are also mounted on pretty great little wheels. That said, Glide also sells a model with EVA tires—so if you want the air tires, pay attention to which model you’re buying. The EVA version is quite a bit cheaper ($69 compared to $99 with the air tires). Although pneumatic air tires do risk going flat from time to time (which can be a pain), they are superior to foam tires for nearly all little riders. Pneumatic tires provide better traction and comfort compared to foam/plastic. Unless your kiddo is going to ride solely inside the house (ha) or in the driveway, I always recommend choosing air tires. The Mini Glider comes in cute colors, has a shiny paint job, and is sure to grab the eye of all the little kids that come over to play. Adding to the playfulness, the Glide’s unique footpeg encourages kids to lift their feet while “gliding” along. Unfortunately while the footpeg is great in concept, I found it to be less useful in reality. 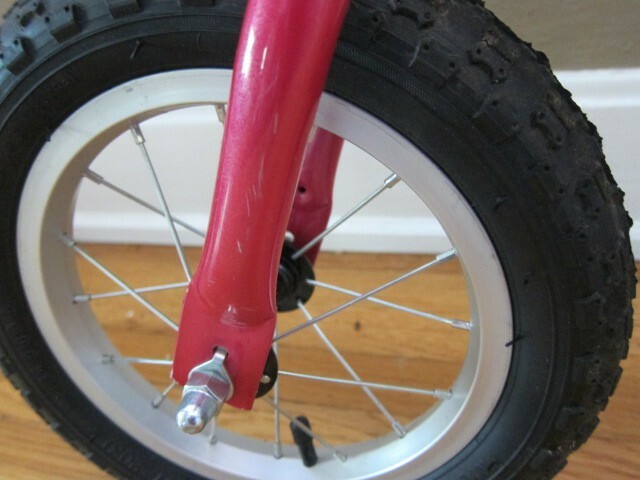 When my very experienced balance bike tester (aka my 3 year old son) tried putting his feet on the pegs, his toes actually ended up rubbing the wheel. I coached him to put his feet further back with only his toes on the pegs, but he quickly grew frustrated and gave up. After a few more test rides, he finally did get the hang of it, but the pegs weren’t inherently easy to use (at least for my kiddo). One other note on the footpeg: while we haven’t yet tested the Mini Glider off-road or at the bike park, I could see how the pegs may get in the way for more aggressive riding environments. 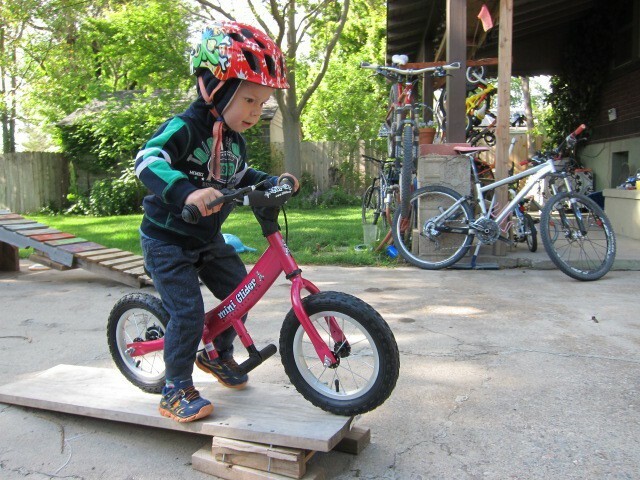 There isn’t a lot of clearance if a child is trying to ride up and over obstacles. If your kiddo is going to be riding primarily on the sidewalk and in the driveway, this isn’t an issue. Another feature that is unusual to find in this price-range is a quick-release seatpost. 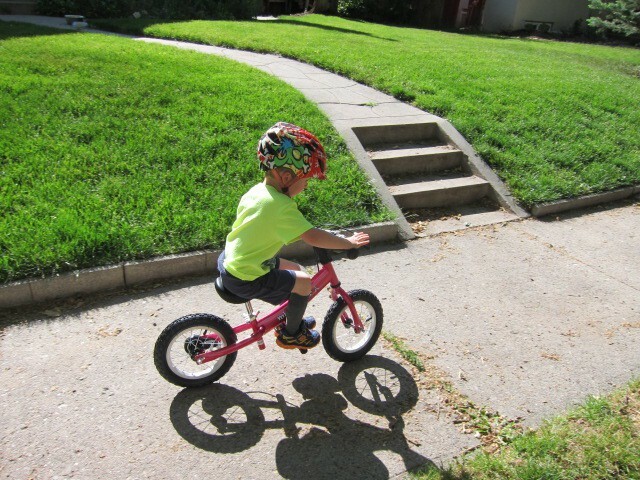 Considering that kids this age grow 2” seemingly overnight, a quick-release seatpost is a must in my opinion. It makes it easy to quickly raise the seat height, or to switch the bike between two riders of different sizes. 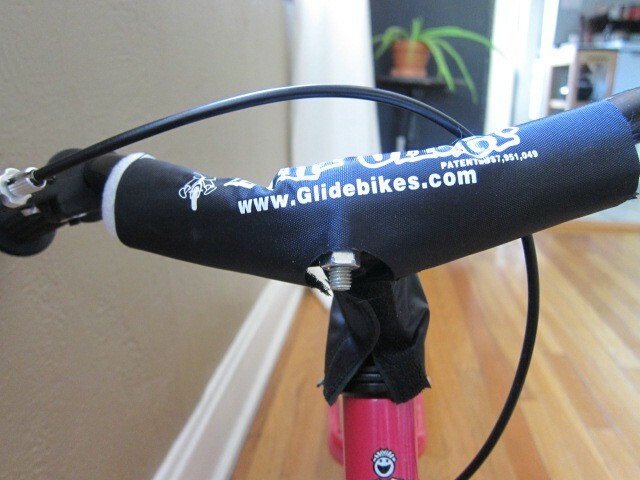 Bravo to Glide Bikes for including this in their design. While I was initially really excited to see that the Mini Glider comes stock with a hand-brake, that dissipated when I discovered how difficult the brake lever is to operate. In fact, this is one of the first things my 3.5 year old said about the bike: “Mom, the lever is too hard to pull.” Turns out the hand brake is great in theory, but pretty much useless in reality. On a more positive note, the brake cable is internally routed which is a nice feature. This keeps the cable clean and out of the way, and avoids any sort of external bracketry which might be a hazard. (On my bike, for example, the rear cable is held on with zip-ties which frequently end up scratching me). Note the internally routed rear brake cable. I love the handlebar on this bike, which has a nice rear sweep. This provides a very comfortable upright riding position for the rider, and is particularly nice for younger riders who don’t need an aggressive riding position. This is another feature that makes the Glide different from a lot of the other balance bikes I’ve seen. Exposed bolts and screws on Mini Glider may be a safety concern. While you can’t expect perfection from a sub-$100 bike, the Mini Glider is a little rough around the edges. The bike already had some chips in the paint straight out of the box. The exposed bolts may be a safety concern to some parents, and there was one exposed screw in particular that seemed a little sketchy to me. That said, I don’t think any of these things are dealbreakers. If this is the bike you can afford, it’s a heck of a lot better than no bike. And no kiddo is going to notice or care about any of these things. Some chips and scratches in the paint. The Mini Glider is cute, fun, and affordable. 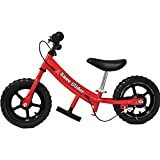 For under $100, this is probably the only balance bike you are going to find that has pneumatic (air) tires. If you can afford a more expensive bike, you might want to consider it. If not, your child will have a lot of happy hours on this bike.